This fixture is located at a private residence in the tiny desert town in Aguila, AZ. 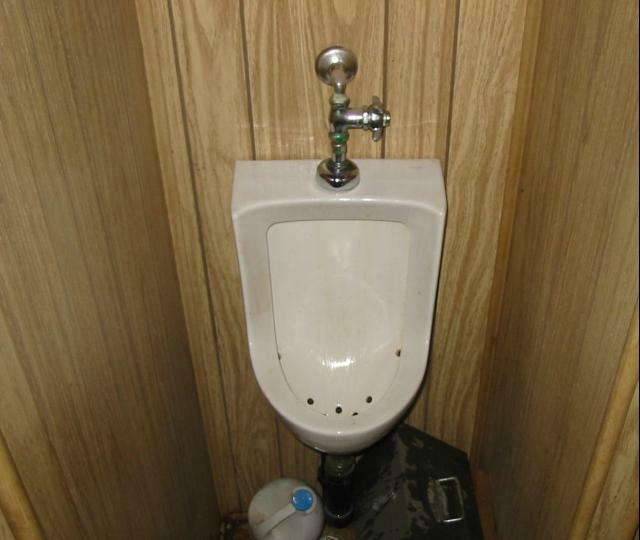 This urinal was submitted by the owner, Dawufman. He writes: "She�is a 1983 ELJER with a "chrome on brass" 1968 HAWS 'freeze resistant' flush valve (Model unknown), which has been in service since 1991 when I recycled her. (actually saved her from demise under the bucket of a front end loader in an attempt to bury her illegally in a gravel pit)... Working flawlessly I might add after removing the sand and small rocks from the drain." Another one of the three urinals in Aguila, AZ can be found at Jim's Lazy 'G' Saloon and Cafe.